While there are hundreds of "animal rights" organizations, the only animal who has any legal rights at all is the human animal. And this is the first time anyone has gone to court in the United States seeking to obtain a legal right for a nonhuman animal. So we have entered into entirely new legal territory. But the appellate court has already issued a ruling that indicates that they take Tommy's case seriously. In July, the court voted unanimously to grant a preliminary injunction that prevents Tommy's owners from removing him from New York State pending the completion of the appeal or further order of the court. In order to obtain this injunction, the NhRP had to demonstrate that it was likely to prevail on the merits of the appeal. With this decision, the court has indicated that our appeal has a reasonable chance of success. And so, on October 8th, the NhRP will argue to the New York Supreme Court Appellate Division, Third Department, that chimpanzees are autonomous, self-aware, highly intelligent, emotionally complex beings, who fit the definition of a "person" entitled to a common law writ of habeas corpus when imprisoned within the State of New York. If the appellate court rejects the NhRP's arguments, the organization will appeal this decision to the highest court in New York: the Court of Appeals. When these first lawsuits were filed, last December, they made headlines all around the world, and Tommy's appeal may well make headlines again. Legal experts, attorneys and animal rights organizations worldwide have been taking note of the strategy of seeking legal rights for nonhuman animals through the ancient writ of habeas corpus. This is the same approach, for example, that was taken in the groundbreaking case of a slave, James Somerset, who was taken to London by his "owner". A team of attorneys filed suit on his behalf, arguing that he was a "legal person" who could therefore not be held as property. In 1772, the famous judge Lord Mansfield agreed and ordered that Somerset be freed. As a result, similar suits were soon being filed in the newly established United States. While the appeals process on behalf of the New York chimpanzees works its way through the courts, the NhRP is already preparing its next round of lawsuits, which will likely be on behalf of a group of elephants who are being held at a zoo or circus. And the organization plans to keep filing suits on behalf of animals whose degree of complex cognition, self-awareness and autonomy fit the profile that courts have used in the past in recognizing someone as a "legal person" with the capacity for certain appropriate legal rights – in this case the right not to be kept in captivity. Steven M. Wise, the founder and president of the NhRP, says, "We are seeking to break through the legal wall that separates all humans from all other animals." He argues that whether or not you have any legal rights should not be determined by your species any more than, among humans, it should be determined by your gender or your age. The cases of Tommy and the other three chimpanzees have already begun to influence the thinking of judges around the country. Last month, the Oregon Supreme Court ruled that a police officer had not erred when he entered private property without a warrant to seize a horse who was dying of starvation. The court wrote about "the ongoing evolution of the legal status of animals," noting that "the day may come when humans perceive less separation between themselves and other living beings than the law now reflects" and citing the lawsuits filed by the NhRP in New York. The Oregon Supreme Court accurately captured the rapidly growing stages of a state, national and international legal movement to recognize the legal personhood of nonhuman animals.
. . . With this case the Oregon Supreme Court signaled they recognize the changing legal status of nonhuman animals. 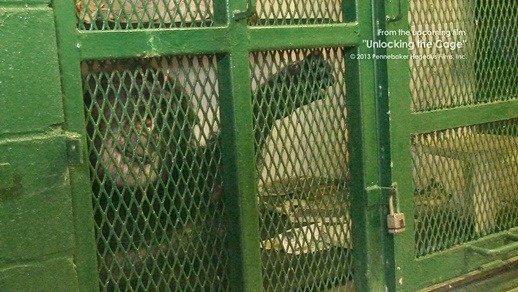 "We did not ask that chimpanzees be considered human beings, which they are not, but that the courts take into account the views of the 12 most renowned primatologists in the world, supporting the proposition ... that they have autonomy and self-awareness, that they build tools on their own, communicate by signs, self-medicate, and have complex cognition like our own." In its ruling about the horse, the Oregon Supreme Court also noted that India's Central Zoo Authority recently banned the exhibition of dolphins, after concluding that their status was "closer to that of 'non-human persons.'" "Your impassioned representations to the Court are quite impressive. ... However, I do not agree with the argument only insofar as Article 70 applies to chimpanzees. Good luck with your venture. I'm sorry I can't sign the order, but I hope you continue. As an animal lover, I appreciate your work." So, while Judge Sise said that he could not entertain the application for a writ of habeas corpus, he helped prepare the ground for the appeal that will be heard next month. Whatever happens in Tommy's appeal, there's little doubt now that the legal wall that separates all humans from all other living beings is already being breached. * * * Oral arguments in Tommy's case are set for 1 pm on October 8th before the Supreme Court, Appellate Division, Third Judicial Department in Albany, NY. It is open to the members of the media and the public.